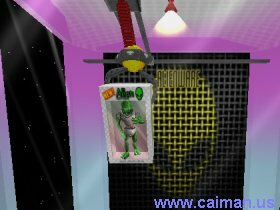 Caiman free games: UFO Catcher by Walaber. 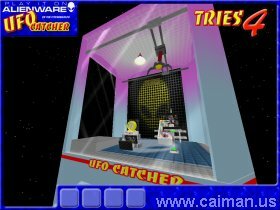 The Alienware UFO Catcher is the most popular attraction in the Galactic Arcades. See if you can collect all of the toys in all 8 levels of play. There are 4 different types of Alienware toys, but many come in different colors too, so COLLECT THEM ALL!!!! Tracht al het speelgoed met een kraan uit de kas te vissen. 8 levels en 4 verschillende soorten speelgoed. VERZAMEL ZE ALLEMAAL !!! Authors home and downloadpage . Direct DOWNLOAD from authors site (install) 7,42 MB.